Three, two, one ... We have plasma! 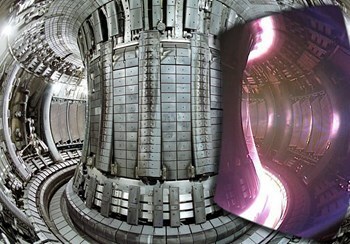 Inside the European JET Tokamak, both during (right) and after operation. Photo: CCFE, JET. At the core of fusion science is plasma physics. At extreme temperatures, electrons are separated from nuclei and a gas becomes a plasma—an ionized state of matter similar to a gas. Composed of charged particles (positive nuclei and negative electrons), plasmas are very tenuous environments, nearly one million times less dense than the air we breathe. Fusion plasmas provide the environment in which light elements can fuse and yield energy. Three conditions must be fulfilled to achieve fusion in a laboratory: very high temperature (to provoke high-energy collisions); sufficient plasma particle density (to increase the likelihood that collisions do occur); and sufficient confinement time (to hold the plasma, which has a propensity to expand, within a defined volume). 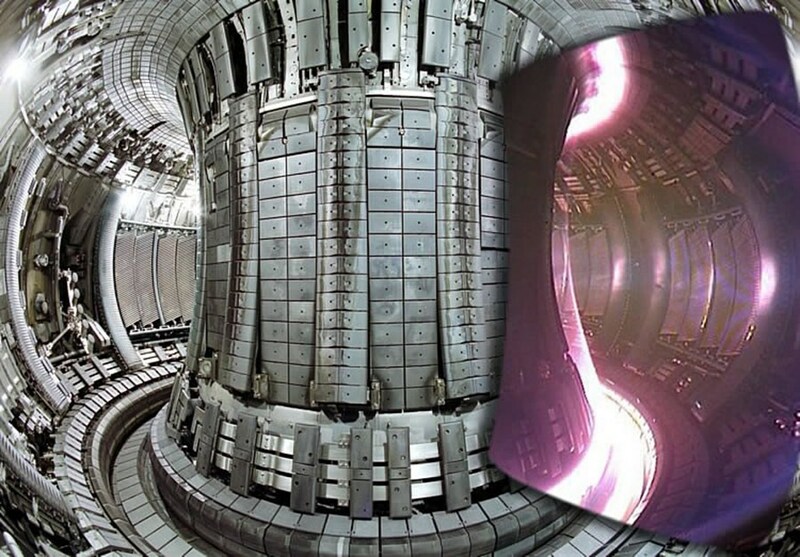 In ITER, fusion will be achieved in a tokamak device that uses magnetic fields to contain and control the hot plasma. 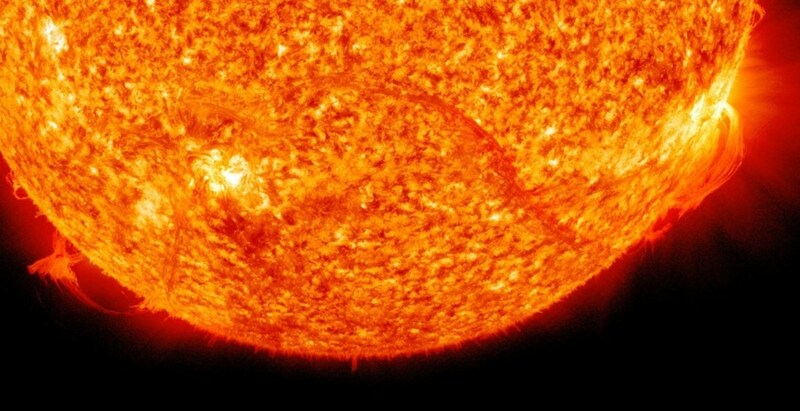 The plasma particles are heated—that is, sped up—by different types of auxiliary heating methods. The fusion between deuterium and tritium (DT) nuclei produces one helium nucleus, one neutron, and great amounts of energy. More than 99% of the Universe exists as plasma, including interstellar matter, stars and the Sun. Examples of plasmas on Earth are: neon tubes, lightning, the northern lights (aurora borealis), and the glow of plasma televisions. The helium nucleus carries an electric charge which will be subject to the magnetic fields of the tokamak and remain confined within the plasma, contributing to its continued heating. However, approximately 80 percent of the energy produced is carried away from the plasma by the neutron which has no electrical charge and is therefore unaffected by magnetic fields. The neutrons will be absorbed by the surrounding walls of the tokamak, where their kinetic energy will be transferred to the walls as heat. In ITER, this heat will be captured by cooling water circulating in the vessel walls and eventually dispersed through cooling towers. In the type of fusion power plant envisaged for the second half of this century, the heat will be used to produce steam and—by way of turbines and alternators—electricity. In terms of sheer scale, the energy potential of the fusion reaction is superior to all other energy sources that we know on Earth. Fusing atoms together in a controlled way releases nearly four million times more energy than a chemical reaction such as the burning of coal, oil or gas and four times more than nuclear fission.